She's still got it! 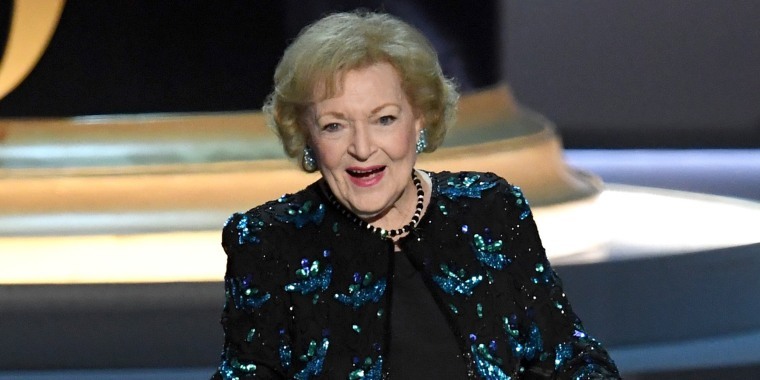 The legendary actress has been around longer than the Emmy Awards, and it's easy to see why her career just keeps going. The very first Emmy Awards ceremony took place 69 years ago, and while that means the honors are now older than the vast majority of the stars who attend them, that's not the case for one small-screen legend. Betty White wasn't only around back then, she launched her television career a full decade earlier. She's been nominated for an Emmy 24 times and won eight times. But when she took the stage — to an enthusiastic standing ovation — at Monday night's show, she wasn't there to take home No. 9. Evidently, she was there to steal the show. Kate McKinnon and Alec Baldwin were on hand to introduce the comedy legend, with McKinnon calling her "the greatest of all time." Baldwin had some raves of his own about her, but White was more interested in getting a kiss on the hand from the handsome star. "You think I'm going to miss a chance when I get it?" she said to laughs after the smooch. White offered up a few jokes at her own expense, like bringing up her iconic status as "the first woman of television," but claiming it was more of a literal statement than a compliment. But in between the laughs, she got serious — seriously grateful — and even teary-eyed. "It's incredible that I'm still in this business," the 96-year-old said. "And you are still putting up with me! It's so unbelievable." The audience erupted in cheers — not for the first time — and she practically shushed them, adding, "No, I'm thanking you!" And there was one person in the crowd she wanted to mention in particular, TV producer, writer and "Saturday Night Live" creator Lorne Michaels, who arranged for her Emmy night highlight. "I want to thank Lorne Michaels for doing, not only this tonight, for all of the wonderful things he's done with me ..." she said, waiting out just the perfect comedy beat before correcting herself with, "No! For me." Michaels blushed, but White just kept going and kept earning smiles from the star-studded crowd that was obviously filled with fans. Of course, with a career like hers, that's included "The Mary Tyler Moore Show," "Mama's Family," "The Golden Girls" and so much more, it would be hard to assemble any group and not have it be filled with fans. She noted, "All I can say is it's such a blessed business to be in, and how lucky can I be?" And how lucky are the rest of us that she's still in that business?